Luxury Is In The Details: Are You Paying Attention To Details? When Kanaloa, our fishmonger, decided to move to downtown Santa Barbara, they planned to also open a café within the store with an outdoor seating area. This was a natural for them, as one of their employees is a chef. Yesterday, we had lunch there. We both ordered an assortment of fish tacos (the tortillas are hand made on site). After the first bite we were both delighted by the freshness, spicing, delicate crispiness and taste of these tacos. 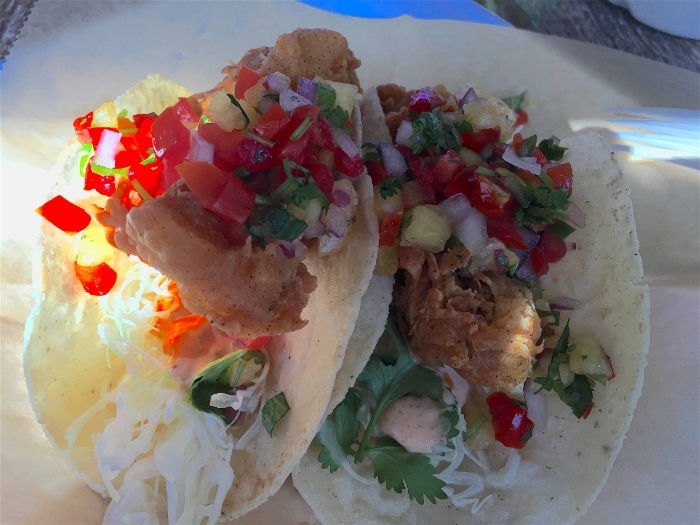 As we enjoyed our tacos, we noticed so many details that made the meal even more enjoyable. Our tacos came on a biodegradable cardboard rack/holder (pictured above). When we asked our hostess as to where they bought the taco racks, she told us, they had them made. This makes eating tacos easier. It does not fall apart and make a mess on your plate. We have seen the plastic and metal versions. However, in keeping with their sustainable and eco friendly mindset, these cardboard racks are recyclable. This attention to detail is what keeps us coming back, and telling everyone about them. As we were waiting for our yoga class to start yesterday afternoon, we told everyone gathered about our experience at Kanaloa.